High up in the mountains there’s lots and lots of snow which means lots of opportunities for playing snow sports! Every winter, hundreds of thousands of people journey up into mountain ranges all over the world to enjoy snow sports like skiing, tobogganing and snowboarding. Although mountain ranges can be fun and beautiful, they can also be wild, treacherous and a difficult place to conduct rescue missions. Just like the snow does way up in the mountains, the reels in Wild Rescue can tumble and avalanche, however, in this slot game they’re great features, not scary and dangerous ones! This game is best suited for players who aren’t beginners as it might be a little overwhelming to newbies but for well-seasoned players, this game is perfect! Fans of other Novomatic slots such as Book of Ra Deluxe and Lucky Lady’s Charm Deluxe will especially enjoy spinning these tumbling and avalanching reels. 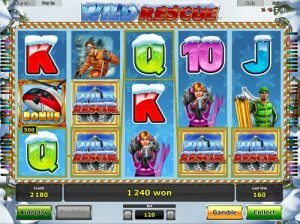 Wild Rescue is a 30-payline slot with 5 reels that are filled with wonderfully-designed symbols! These, along with the mountainous background of this slot will have you dreaming of your next holiday on the slopes. From the lowest-paying symbols in ascending order of value there are: the card values from the 10 to the Ace; the skier in pink holding her cup of cocoa; the tobogganer in a green gilet; the skier in his orange onesie; the rescue lady with her walkie-talkie and the rescue man in his goggles. These ‘normal’ symbols will pay out cash when you spin three or more on one of the slot’s paylines on consecutive reels, starting from the left. Payouts will be bigger when the value of the symbol is higher; the number of matching symbols is higher and when your bet is larger, too. You can alter your bet by using the buttons to increase or decrease it. Al 30 paylines are fixed so the minimum bet is 0.30. When you spin a winning combination of symbols, the winning symbols will disappear and the reels will tumble to fill in the missing symbols, and they’ll keep tumbling until no more winning combinations are present. On the third tumble, the reels will avalanche and for this feature, a generous number of Wild symbols will fall all over the reels like avalanching snow and these avalanching Wilds will dramatically increase your chance of getting a big win! There are two untamed symbols on these reels: the Wild Rescue symbol and the Bonus symbol. The Wild Rescue symbol is the Wild symbol which means it can substitute for any of the others except the Scatter symbol. The Scatter symbol is the Bonus symbol which is the rescue helicopter and if you spin three or more of this symbol, you’ll trigger free games! During the free games, the skier in his orange onesie starts extreme skiing and turns into another Wild symbol to help you get more wins. The rescue man in his goggles can also turn Wild but he does this during the tumble feature which happens after you can wins and payouts in the normal game. Typically of Novomatic, they’ve added some features into Wild Rescue which will be totally familiar to Novomatic casino fans! You can play this game in autoplay mode which is great for anyone who’s multi-tasking or sick of clicking! You can also use the Novomatic-esque gamble game which helps you heat things up and thaw the ice in this game by enabling you to multiply your wins! This slot is a classic Novomatic slot, through and through, just like NovomaticCasino.co.uk is Novomatic through and through! Here, we have all of Novomatic’s best casino games, including their slots, video slots, live casino games and table games, including Roulette and Poker.